PANJIM: The state IT Policy will be presented on July 14 and it will go for cabinet approval soon. It will be presented along with special schemes. This was revealed by a source to the Herald. This policy is a redrafted one and incorporates various inputs. 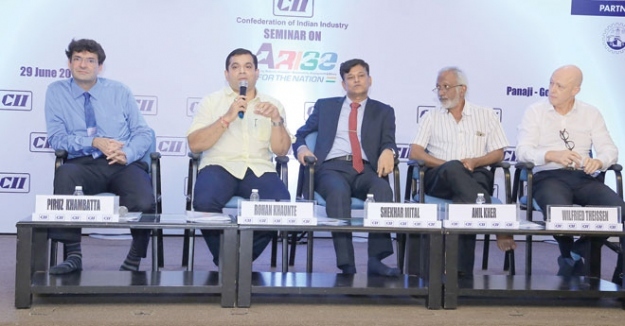 Meanwhile at an important industry gathering organised by the CII, Rohan Khaunte, Minister for Labour and Employment stated the Govt of Goa had already been collecting data on the potential employment requirements from the Industry in Goa. He appealed to all the employers to share this valuable information through the Govt portal and once they can get the data the employment exchange will be able to identify candidates for the same and also train unskilled personnel as per the requirement of the industry. Mr Khaunte said pressure would be applied on companies that had a biased approach vis-à-vis locals and outsiders and action would be taken. With regards to just 15% of companies providing data on who they were employing, letters have been sent and the minister revealed that when they could now come to renew their shop and establishment licenses in October and November then they will have to share their data before they get their renewals. The minister along with industry dignitaries were present at a seminar called ARISE: (Accountability, Reforms, Innovation, Sustainability & Employment) for the Nation – CII Focus for building India of the Future was launched in Goa. ARISE will take into its ambit sensitizing industry on ethical practices, promote innovative and new business technologies, push for sustainable development and promote employment and skill development through reforms and policy enhancement. Piruz Kambaatta, chairman, CII Western Region Council and CMD, Rasna Pvt Ltd said at a personal level he did not believe in the idea of reservations because as history had shown everyone it did not work even for people it was intended for. He said “Education is the key and good education should be given to everyone and then they can find jobs anywhere in the world”. During the first session on ‘Accountability’ - RAdm Shekhar Mittal, chairman, CII Goa State Council andCMD, Goa Shipyard Ltd said that ethically all industries are responsible for its own function therefore accountability should the buzz word for all professionals. Shrinivas Dempo, Past Chairman, Western Region during his discussion in the session on ‘Reform’ said that Policy Reforms is an alliance between the stakeholders and Govt for the betterment of society. And that when we see the economy gets better in the State then it is directly correlated to the success of efficient reforms in policy. Ameya Abhyankar IAS, Secretary, Information Technology stated that experience and exposure drives innovation so we need to develop an organisational structure where they identify and encourage innovations inside the organisation. Pardip Sarmokadam, Member Secretary, Goa State Biodiversity Board in the session for ‘Sustainability’ was of the opinion that sustainability is a way to get the economic issues addressed by keeping in harmony with the environment. Bharat Kamat, Chairman, Indian Green Building Council – Goa Chapter also defined that Green Building is a way of using less resources and create healthy indoor environment. Policy Reforms is another area of focus and the biggest need for the development of industry. Innovation is also essential as it will give a competitive advantage for industry to thrive in an intensely competitive global market. To foster innovation, we shall facilitate more and more industry-academia linkage fora. We also have a dedicated Taskforce on innovation and startups that aim to encourage innovation among industry. Sustainability is the buzzword today and industry and society recognises the importance for development to be sustainable. This year, we will also be focusing on promoting industrial safety, adoption of green practices in manufacturing and infrastructure. Missions & Delegations will also be facilitated to strengthen sustainable practices. Increased focus will be laid on renewable energy, facilitating creation of charging infrastructure for Electric Vehicles and City Connect initiatives.